See all in What is literacy? Written language can be compared to a code, so knowing the sounds of individual letters and how those letters sound when they’re combined will help children decode words as they read. Understanding phonics will also help children know which letters to use when they are writing words. Phonics involves matching the sounds of spoken English with individual letters or groups of letters. For example, the sound k can be spelled as c, k, ck or ch. Teaching children to blend the sounds of letters together helps them decode unfamiliar or unknown words by sounding them out. For example, when a child is taught the sounds for the letters t, p, a and s, they can start to build up the words: “tap”, “taps”, “pat”, “pats” and “sat”. 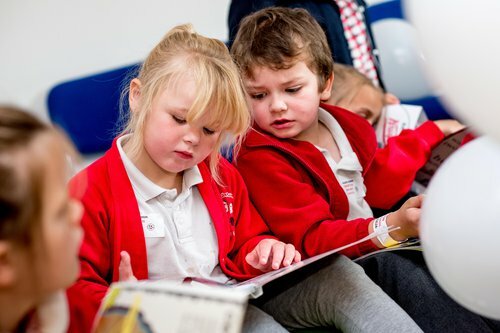 Introducing young children to the joy and wonder of books requires a systematic teaching of phonics. The most widely used approach associated with the teaching of reading in which phonemes (sounds) associated with particular graphemes (letters) are pronounced in isolation and blended together (synthesised). For example, children are taught to take a single-syllable word such as cat apart into its three letters, pronounce a phoneme for each letter in turn /k, æ, t/, and blend the phonemes together to form a word. A popular approach in Scotland, this method is associated with the teaching of reading in which the phonemes associated with particular graphemes are not pronounced in isolation. Children identify (analyse) the common phoneme in a set of words in which each word contains the phoneme under study. For example, teacher and pupils discuss how the following words are alike: pat, park, push and pen. A type of analytic phonics in which children analyse phonic elements according to the phonograms in the word. A phonogram, known in linguistics as a rime, is composed of the vowel and all the sounds that follow it, such as –ake in the word cake. Children use these phonograms to learn about “word families” for example cake, make, bake, fake. An approach to the teaching of reading in which phonics forms one part of a whole language programme. Embedded phonics differs from other methods in that the instruction is always in the context of literature rather than in separate lessons, and the skills to be taught are identified opportunistically rather than systematically. This resource contains a selection of high-quality picture books that support the teaching of phonics. A quick guide that defines and covers some of the basics of synthetic phonics. Aimed at those new to phonics, parents and secondary colleagues struggling with late decoders.